"Fast and VERY kid friendly.. they can make them and all you have to do is bake them! 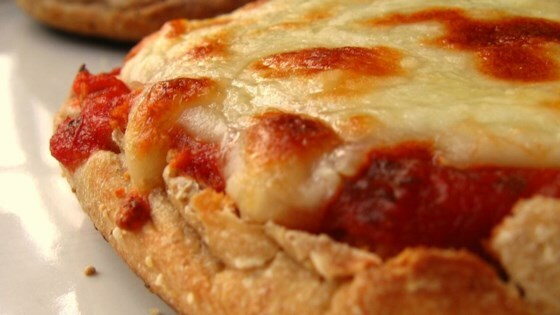 Pizza sauce, cheese and their choice of topping makes this a great snack or anytime meal!" Place the English muffin halves cut side up onto a baking sheet. Spoon some of the pizza sauce onto each one. Top with mozzarella cheese and pepperoni slices. We have been making these for years. It is great for a quick meal or hearty snack. Toasting (or baking) the muffins before adding the sauce and cheese gives them a nice crunch, too. These make a great snack, and if you don't have any pizza sauce on hand, try them using ketchup (and adding a little garlic powder and oregano), or bbq sauce for a different flavor! this was a quick and easy dinner for me and my 3 y/o. i took the advice of others and cooked the english muffins for 5 mins or so before i added the toppings.